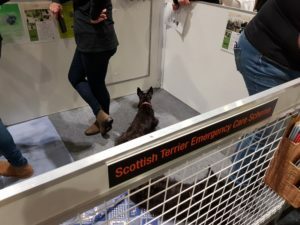 On Saturday October 21, London Scottie Club was privileged and thrilled to join our pals at the Scottish Terrier Emergency Care Scheme ("STECS") for their annual turn at the Kennel Club of Great Britain's Discover Dogs showcase. 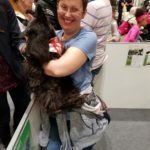 At one time housed in a larger venue at Earl's Court, Now at London's ExCel near City Airport it remains a premier destination for anyone keen on having a dog as a pet. 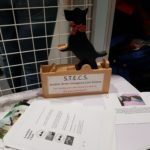 STECS had a pen right in the centre of the event, in the Kennel Club's own space. Unmistakable by their looks, Scotties were even more noticeable. 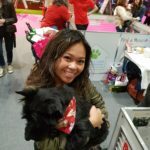 Many of the visitors already owned a dog but many others weighed up whether they have the right sized residential privileges to own a pet where they live. 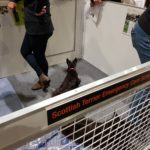 Scotties were certainly on the shopping list of many event-goers. 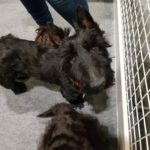 Thousands poured in and three wonderful Scotties were on display and despite their rescue adventures, enough to bring tears to your eyes, happily all of them have been rehomed with STECs volunteers who were on hand. Meet 15-year-old Margie. Homed by Cath, the welfare officer of STECS no less, you know she's in good hands. But her own are frail. Margie has arthritis in her front paws but still mobile. She caught a lot of people's attention. Then there was Oliver living with Peter and Jilly. He has a brain disorder called CA which affects the walking and balance of the dog. It is normally diagnosed at birth and there is no obvious cure. But Oliver eats, breathes, barks and can jump onto sofas. It is just that he has a challenge staying steady when on his paws. Aged 14 years, I think it is fair to say he is living a full life, bravo! Finally, there is three-year-old Robbie. He even met someone who shares his name at the event. Robbie had been mistreated and found to have a skin condition which rendered him - totally - bald. He wore a blue medical coat to stay warm. But two years of effort and a treatment over just three months has given this dog the Spit The Dog look, and that means a full fur! Looks super. He too is owned by Peter and Jilly. We were also joined by London Scottie Club member and STECS volunteer Susanne Page and her husband. 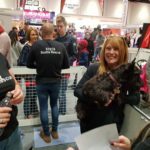 We all rolled up sleeves to talk to the public about the Scotties, often picking them up so that people could get a better look and kids could stroke them. A lot of awww was heard. And Spanish television interviewed some of us which was fun for the dogs, we hope. No one mentioned that around the corner there was a Catalan Sheepdog stand! 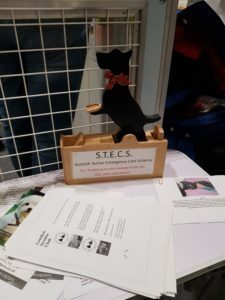 But Discover Dogs is a serious event and an important date in the STECS calendar. Although all manner of dog lovers shuffled through, many of them were drawn to the iconic Scotties. 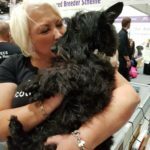 We hope that some of the interest will convert into demand to rehome Scotties, but demand already outstrips supply - which is a good result - and STECS is keen for the public to know what they are taking on when they commit to a Scottie. The Excel facility is brilliant for the event especially with a large lawn outside the East Exit. All manner of dogs went out there to relieve themselves.